Sharon Lorenzo views the Art of Native America exhibit. 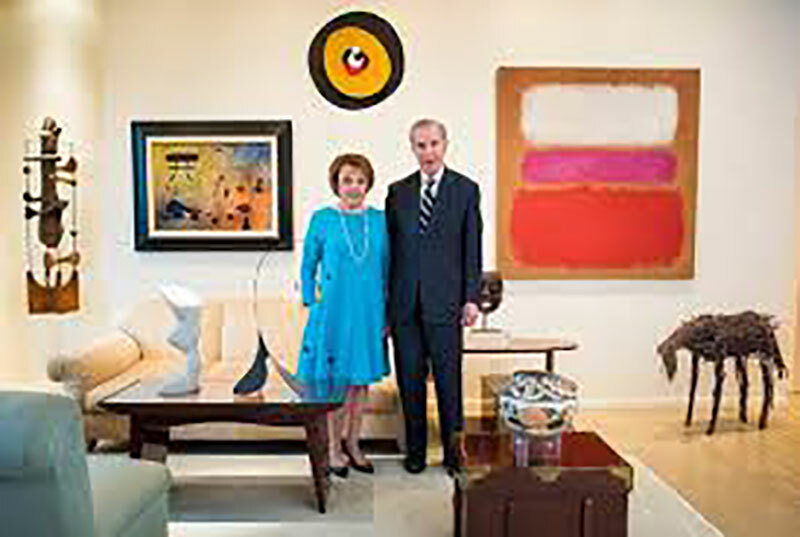 For 45 years Charles and Valerie Diker have been collecting items to add to their extraordinary assortment of Native American art holdings, 101 of which are now part of the collection of the Metropolitan Museum in New York City. A shaman would have used a rattle such as this one above from the Diker Collection to invoke supernatural powers with songs and prayers to heal the sick and secure blessings for those present. The teeth carved from animal bone and the ruff of human hair above suggest a very fierce but evocative meaning from the piece. 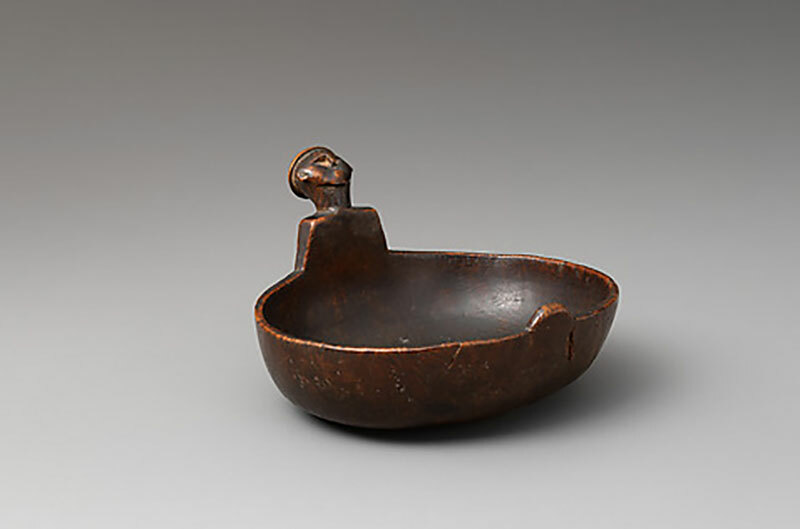 An effigy bowl such as this one pictured below might have accompanied the rattle in the ceremony as a human form emerges from the handle of the vessel which appears worn from frequent use. Bowl, Huron artist, New York ca. 1740, wood. This unusual piece of handiwork from a moose antler represents the meeting of a Seneca chieftain with a colonial American settler presumably joining hands in dialogue and partnership in the early wilderness. Such representations are very rare and witness communal agency at work in the 17th century before American independence. Shoulder bag, ca. 1800, Anishinaabe artist, black dyed deerskin. 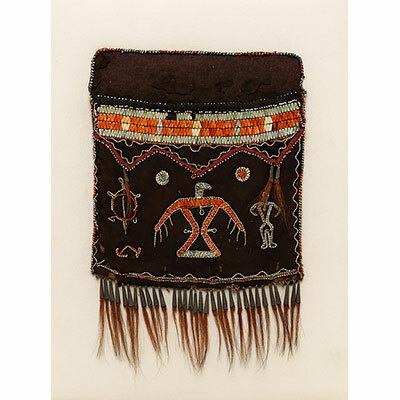 Sophisticated items such as this black dyed shoulder bag made from deer skin may have been used to store tobacco and a pipe for a ritual ceremony. [ii] We know that the dye for this would have come from the black walnut tree and the decorations above are executed with porcupine quills. The central figure of a thunder bird with its prospective hunter on the right both show references to the heart of each in the stitching, perhaps linking the man and his prey with some pictorial imagination. 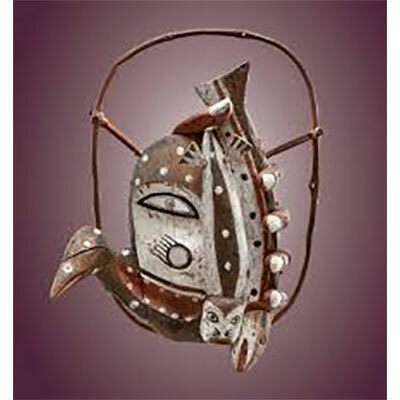 The Dikers often found such treasures at the annual art fairs in Santa Fe, New Mexico where they enjoy a second residence outside New York City. Basket Bowl, 1907, Louisa Keyser. 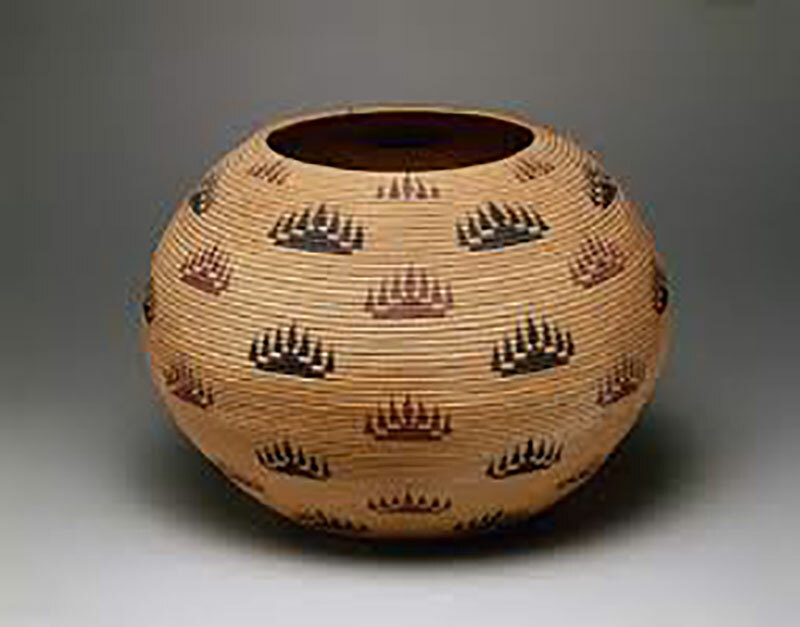 In addition to sacred objects, the Dikers also appreciate the craft traditions of the Native American communities such as this basket bowl made from willow and redbud shoots woven with local dyes near Carson City, Nevada. Louise Keyser was known during her lifetime as a gifted weaver whose tight methodology even allowed the bowl to hold water without leaking from its interior. Polychrome Water jar, 1895, Arizona. 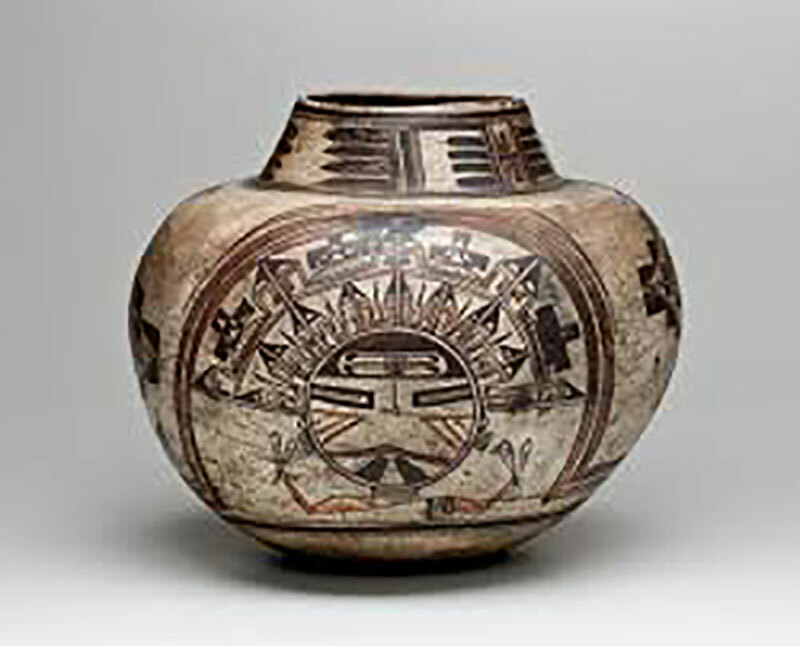 A member of the Hopi nation named Nampeyo made this water jar from clay and pigment embracing their ceremonial headdress in the foreground of the vessel. This utilitarian pot therefore becomes a sacred object as it demonstrates their ritual dance which united the tribe in worship of its ancestors. Yupik Mask, Alaska, ca. 1900. Wood, pigment and vegetable fiber. 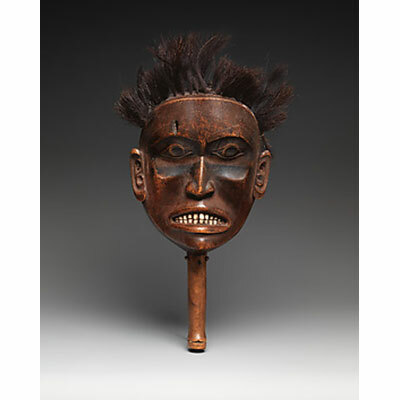 Nothing is more impressive than this Yupik Mask from the Diker Collection which embraces animal strength and human features in a ceremonial piece that would have been used in performances to invoke ritual blessing and good wishes for the seasonal hunt or ritual gathering. There is no word for “art” in most of the indigenous cultures of the Americas, as works were either for functional use or ceremonial practice only. Transmission of knowledge, power and protection were the intentions of these items, designed to give the audience and the performer vision and fortitude. These are but a very few of the brilliant items in the Diker installation which will bring wonder to visitors of all ages. 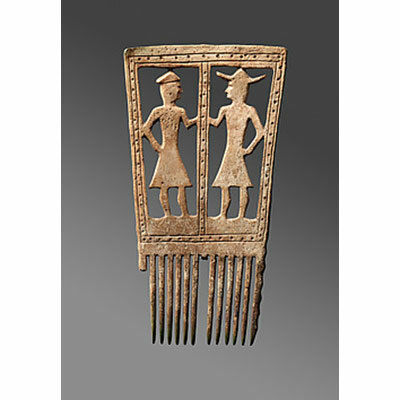 While simple in form and intent, they are rich in meaning and interpretation which the gifted curators have noted in the catalog of this collection which has found a welcome home in the American wing of the Met Museum in New York in perpetuity. [i] Rick W. Hill, Venerable Objects, Their Creators and Cultures, Art of Native America. Metropolitan Museum of Art, p. 51, 2018. [ii] Gaylord Torrence, Ibid, p. 36.
good show! wish i could be there to see it.